Summary: Since her birth, Ah Xun as well as her sister Yicheng, has been suffering from a heart disease, which makes her unable to run or do a lot of activities that other kids do. Because of this she is picked on by all her schoolmates. Her only friend is a boy named Qing Chuan. Always together, Ah Xun is saddened when Qing Chuan tells her that he and his family are moving to America. 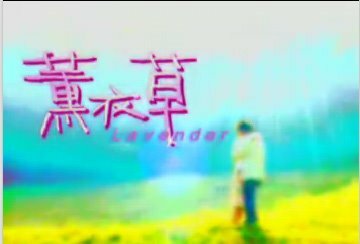 Unwilling to never see each other again, Qing Chuan gives her a glass bottle filled with a piece of lavender as a token that he will never forget her, and promises her that he will meet back up with her 10 years later on Ah Xun’s 20th birthday. Ten years pass and Ah Xun still has not forgotten her first love Qing Chuan, even though her boss’s son Xiao Tong is in love with her, waits for the day when she can see him again. Qing Chuan returns to Taiwan, but this time known as the famous singer named Leo. Leo has not forgotten about her either, and after a few misunderstandings, the two of them meet back up and start a relationship. But with the presence of Xiao Tong, Leo’s girlfriend Maggie, and Ah Xun’s illness, they wonder if they will be able to stay together. Laveder is a good drama! The ending is really sad though.